Gradex Ltd. started working on the subject of preventing premature appearance of reflexion cracking in asphalt pavements over 10 years ago. In Hungary the subbase layer of road structures is characteristically cement stabilised, made very strong to meet the regulations. Cement stabilised layers require dilatation. The safest procedure to do this is “crafting”which is made at every 2-3m, thus allowing movement of the hydraulic course. Where no other measures were taken, these transverse joints creeped to the wear course within 1-2 years, causing the quick failure of the road structure. A good example of this is found on the Kecskemét bypass section of Motorway M5. The solution is to construct a “slipping course” between the cement stabilised and the asphalt base courses that prevents these cracks to creep to the wear course, or significantly delays it. 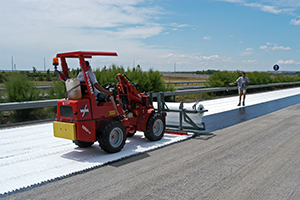 Over the past 10 years we installed this course in more than 12 million square metres in motorways and public roads and even the oldest installations are still functioning very well. Such products were first imported but later using our experience, we started our own manufacture in 2001. 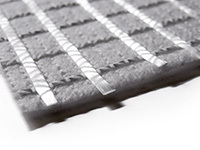 The product is a composite material consisting of a geotextile with glass fibre bundles sewn-on in two directions. 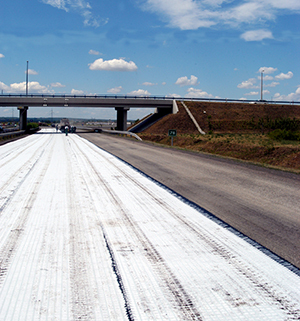 The geotextile saturated with bitumen during the installation acts as stress reliever, the glass fibres reinforce the lower side edges of the lower asphalt base course. The proposed solution prevents the propagation of cracking and significantly increases the service life of the asphalt course.